In this fourth post leading up to my book release, I shall cover one of the most important aspects of book production – ‘the cover’. Old wisdom asks us not to judge a book by its cover. But then old wisdom also also says face is the index of the mind. Isn’t the cover the face of the book and hence the index to its contents? All these sophisms aside, fact is people do get attracted to books by their covers. The way it works for me for unknown authors is first cover, then blurb and then finally maybe first few pages. So, if a book fails at cover stage, blurb does not even get a chance. Here I will share how I went about getting my cover done. When book was almost ready, I started scouting for cover designers. I did have 2-3 artist friends who I always thought would tap for the cover. There was also an artist with an Indi-Publisher I was closely associated with. All these options were available before me. But before approaching them, I thought I will ask around in the author’s group I am part of how others go about it. One of the feedback I got was never to go for standard ones offered by Kindle or do it yourself. The argument against the first was that already many other books will be using the same and the argument against the second was experience of horrendous results when writers try to play artists. One author also suggested a designer who may do a free cover for commenting on her blog. For a budget constrained author, this seemed a blessing from heaven. Who can say no to free stuff. But it turned out, the offer was more than a year old and I could no longer get a cover for free. And I felt like a cheapskate telling her I didn’t want her services if it is not free. So, I asked her for a quote. It was twice of what I had in mind. But I told myself after all it’s my first book. So, I can splurge. Consequently, I went ahead and commissioned her – a woman from Rome. She asked me what the book was about and if I have some example cover in mind. I had never given a thought to this till she asked. All along I thought I will get this magical cover designer who will just read my blurb and conjure the most ideal cover out of thin air. I gave it a thought and then as model gave her the Grimm’s Fairy tale covers. I wanted the reader to be reminded of them as my works were a takeoff from them. 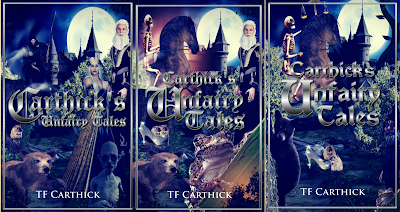 If one notices, even title has been modeled on those lines – 'Carthick’s Unfairy Tales'. And I told her they are a bit darker and probably satirical takes on them. 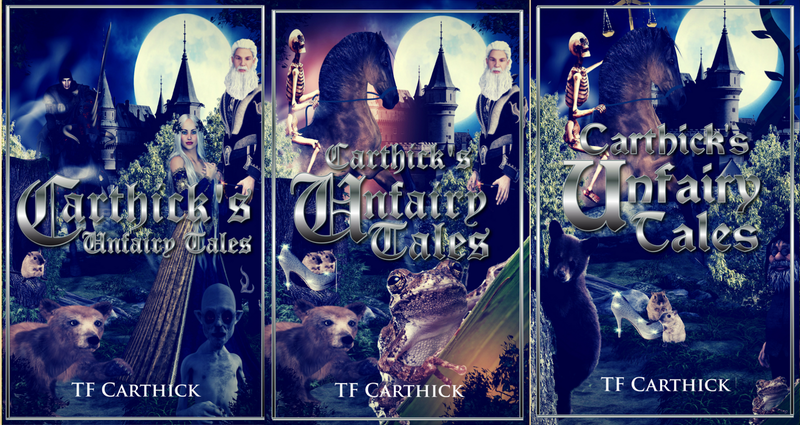 I also mentioned to her certain elements from each story – a princess, a magician, a horseman of apocalypse, a hobgoblin, a mouse and a bear. I was throwing ideas and hoped she would discuss with me and come up with the most ideal one. But she just jumped on my mail and came back with a cover itself the next day with all the elements I mentioned with a spooky night scene backdrop. The backdrop she said would keep with the theme of darker take. It made sense. I gave her feedback on changing some of the elements. I didn’t need the princess as the one she had picked looked more like a witch. Instead I would have a frog. It would also occupy less space. And the horseman did not look like a horseman of apocalypse. The hobgoblin also was looking more like Gollum from lord of the rings. And I needed two mice not one with a slipper next to them. Meanwhile I started sharing the cover around on writer groups. The feedback was so adverse that I was taken aback. Some said the cover looked totally unprofessional like a patchwork of stock images. Some said it gave an impression of a cheap vampire fling. Then there were folks who said it was cluttered and the lettering was unreadable. Meanwhile she was back with a second version of the cover. Now I was in a fix. What was I to do? I was in half mind to call it off. But it wouldn’t be fair to the artist who had already done 2 rounds of design for me. But I began to feel whatever she did, she would not come up with anything satisfactory. I began to feel trapped. I wondered if I should just pay her a small amount for her services and quit. Or should I pay the full amount and forget it? I don’t like to treat anyone unfairly. There was no question of not paying her. I decided to give her another chance and went back to her with all the feedback. She squarely blamed me for the clutter saying it was me who asked for so many elements. And she said I was making her work too much changing the images each time – it was too much effort researching identifying right stock images to use and binding them together on the cover. She said if I wanted any more drafts after this she would charge me $20 per draft. I was furious. Firstly, the cover was going all over the place and the now the artist was also acting difficult. I was in half mind to just stop communication with her and disappear from the horizon. Or just pay up 50% and say enough. However I quietly swallowed my anger and sent her a polite mail apologizing profusely for being so difficult what with me being a first-time author and promising this would be the last draft. The night is advanced and the story is just begun. So let us stop here and keep the rest of the story for another day.